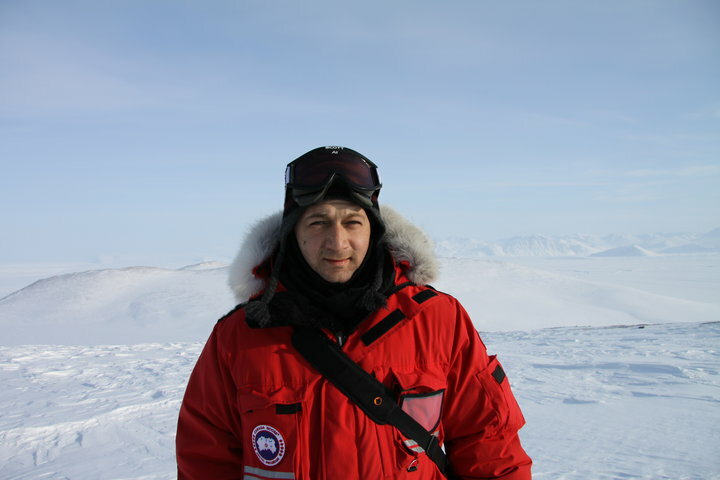 Armenian-born, Montreal-based journalist Levon Sevunts’s career spans over two decades and several continents. He has worked in television, radio and print media, covering politics, business, and culture. 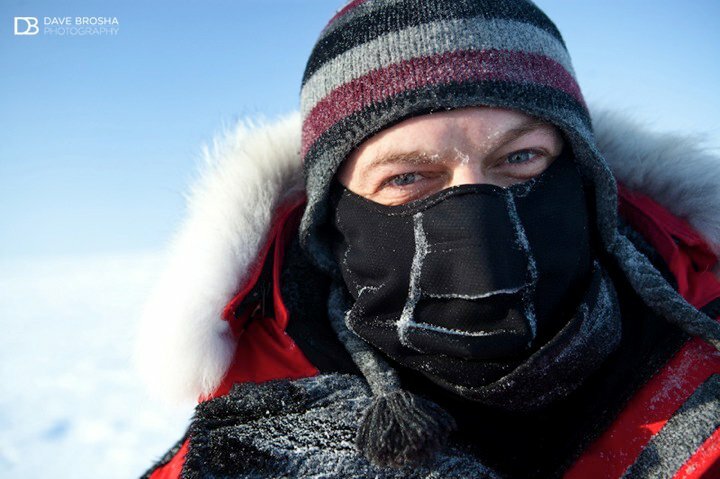 His work has taken him to the frontlines of Afghanistan, refugee camps in Chad, and rebel-held Darfur, Sudan, but he is most passionate about the Arctic, launching a project called Eye on the Arctic in 2010. Sevunts is concerned about corruption in Armenia’s media and the lack of international reporting — specifically the lack of news on Armenia’s neighboring countries reported by the Armenian media. He is passionate about objectivity and believes that a journalist’s job is not to be a PR person for his community. When I completed my military service [in Armenia] in 1989, I became very politically involved in the Karabakh Movement. Since my paternal grandparents were famous Armenian writers, everyone assumed that I too will become a writer one day. So when we started going to the frontlines my friends would turn and say, “Levon, you’ve got to write about this. Nobody knows what’s going on here.” It was true: when we’d come back to Yerevan, it was a completely different reality. One day, a publisher of the newly created Mounetik newspaper saw me in my military fatigues and asked me to write about my experiences. I started writing these little reports, dispatches whenever I went to the frontlines. In August 1991, I was invited to work at the first independent TV news program, Haylur. But in January 1992, it was shut down by the government of the time. My wife and I had an opportunity to come and visit friends in Canada, and so we left Armenia — still hoping we’d come back because we still hoped that Haylur would open. But we came to Canada and stayed. It was tough. And that was the end of my Armenian career. In Canada, a friend of mine in Montreal opened a Russian newspaper and asked me to write a political analysis column for him. In the meantime, I kept submitting op-ed pieces to newspapers in Canada until one day the Montreal Gazette picked up one of my stories: following the 1999 earthquake in Armenia, Columbia, I wrote a first-person account of my own experience of working with some of the same French sapeurs-pompiers, the rescue firefighters, who had come to help in Spitak and Leninakan [during the 1988 earthquake]. But my first front-page story in The Gazette and that got picked up quite widely was a piece on the  attack on the Armenian parliament, where I knew everybody who was involved, both the assailants and the victims, because I had worked with them. The Gazette then offered me a job as a columnist to write about the former Soviet Union. I was hired as an intern by The Gazette in the summer. And right after the internship, they hired me as a reporter. That’s how I started working full-time as a reporter at the Montreal Gazette. In 2001, I was developing a beat on international stories that had a Montreal connection. When it became clear that Afghanistan was becoming a major international news story, the newspaper chain The Gazette belonged to started to look for people to send to Afghanistan. I volunteered: I said I have experience working in a war zone that very few Canadian journalists have, and I speak Russian. I managed to get a visa and travelled to Afghanistan with a fellow journalist. It was my first big assignment basically, it was my big break in journalism, because I was reporting for not only the Montreal Gazette, but also the National Post: basically every CanWest [now Postmedia] newspaper from Halifax to Vancouver was picking up my stories. In 2004, there were cuts at The Gazette and all the CanWest newspapers. I eventually left and worked as a freelance writer for two years. That was a very interesting period too because I got to work on the stories that I really cared about; for example, in 2004, I went to Darfur. I contacted several newspapers and told them I’m going to Darfur. The Toronto Star said, we can’t pay your way there, but if you’re going there, we’ll pick up your stories. And that’s what happened. I continued doing freelance jobs and eventually ended up with a contract with CBC in Ottawa as a diversity reporter. In 2006, Radio-Canada International launched a new radio program about people who are interested in immigrating to Canada and for new Canadians. Because the job was in Montreal, I applied and was hired as a researcher, and then six months later I was promoted to producer. 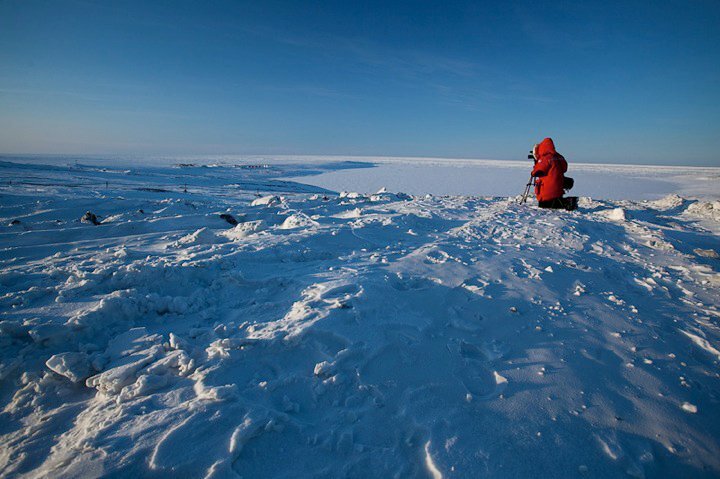 In 2010, I also founded a very interesting project called Eye on the Arctic that’s still ongoing. It’s basically an international collaboration project of all the circumpolar media. Unfortunately, in 2013, I had to leave CBC because of the cuts. Then Breakfast Television, which opened a branch in Montreal, hired me as a news producer. I worked there for two years until last summer, when one of my colleagues at Radio Canada International retired. There was a vacancy, I applied, and for a little over two months now I’m back at Radio Canada International but doing mostly web stories now. Has your military training and your experience working areas of conflict helped your career (specifically in war reporting)? Yes, but the military training is a double-edged sword: on one hand, it helps you with the basics of survival, to understand what’s going on. You can make more informed choices about the dangers facing you. On the other hand, you have to be very conscious that your military training makes you more tolerant of risk. But it’s a definite advantage. You wouldn’t send someone who doesn’t understand economics, doesn’t understand the stocks to cover the stock market, but for a very long time, it seemed perfectly ok to send (very often) very young reporters to cover war zones — people who basically had no idea how to survive in a war zone. Another advantage is an understanding of how the military works. More or less, most militaries work the same way. So you have this insight and that’s a huge thing. Because one of the things as a reporter that you have to do is not only report accurate news, but also provide context for that news. What is your opinion of the media in Armenia, specifically international news reporting? Armenian news coverage has the volume but not the quality of international reporting. It surprises me, how much international news there is, and it’s very brief, very superficial: [the local media will publish] a human interest story from, for example, Uganda, which has nothing to do with Armenia, but very little serious original reporting on issues that affect Armenia’s neighbors and, by extension, us. For me that’s a number one issue. It’s very easy to pick up material from Reuters or CNN or BBC and repurpose it; it’s still good, it gives your audiences a chance to hear a bit of international news, what’s happening outside, but what people don’t understand is that the role of the international reporter is to interpret the country that he’s reporting from for his domestic audiences. For example, with a bit of work, you [addressing local Armenian media] could get good international stories done by Armenian diaspora correspondents reporting issues that are relevant or interesting for an Armenian audience from the countries where they’re based. You have expressed concern over the state of international reporting in Armenia. In an email to me you wrote: “We live in such a complex and dangerous neighbourhood that it's vital for our national interests to have a deep understanding of the issues affecting our neighbours.” Can you elaborate? Yes. I see very few interesting stories on Azerbaijan. And for obvious reasons: Armenian reporters simply cannot travel to Azerbaijan to work on these stories, but with new technologies it’s probably possible to find other ways of doing that. It seems that our reporting of Azerbaijan is limited to the military confrontation, the diplomatic games, and stuff like that, but very little of what is happening in Azerbaijan society. To a lesser degree, the same thing applies to Georgia. It’s just because so many more Armenians travel to Georgia for vacations and so on, there seems to be a bit better knowledge of what’s going in Georgia and because of the presence of the Armenian community there, but even there, I think there’s some very interesting things happening in Georgia that would be very relevant to the experience of Armenia. And I’m not just talking about the Armenian community in Georgia. I think there are very interesting stories in Georgia itself that would be very relevant for Armenia. Corruption, for example. Police reforms, transportation. I think Turkey is a lot easier because there is the possibility of travel to Turkey. I think that’s an area where our coverage can dramatically improve and because of the security implications. Anything that happens in Turkey, it’s paramount for us to understand the country. And for me, to understand the country, you have to not only report on the negative news, but you also have to report on the trends in the society, economy, culture. These are all the things that define attitudes. A huge criticism of the diasporan Armenian media is that the only time we talk about international stories in the diasporan media is when it has something to do with the Genocide. It’s very frustrating to see that huge, international issues don’t get covered in Armenian newspapers, but a city council decision somewhere in the United States to recognize the Genocide will get front-page coverage. What do you think about the argument that news media covers issue of interest to their audience? Do you think that the media’s role is to challenge this and broaden the horizons of the audience and not just report on the issues that their audience is interested in? I think it’s a very fine line. The most viewed videos on YouTube are cat and dog videos, [but] we don’t fill our newscasts with cat and dog videos. As media professionals, we realize that there are some stories that we think deserve coverage because of their significance, the impact they’ll have on the lives of people. What I think is lacking in the diasporan media is the understanding that human stories could be interesting. There are interesting ways that you can do stuff that are engaging, informative, and that kind of broaden the horizons of your readers. Reading the report on international news coverage, I was struck by how little analysis there is, how little current affairs (what would be called current affairs) in the Armenian international news coverage. And how little interviews. It comes to the level of professional journalism in Armenia. If you don’t have that level in covering local issues, there’s no way you’re going to have that coverage in the international issues. The other pet peeve of mine, something that I’m very passionate about is safety. For me, that’s a big issue. Whether news organizations in Armenia have the resources, the culture of safety, which is a topic in itself, when assigning reporters to work in this hostile environment. It starts from everything: whether they have adequate equipment, protection equipment from helmets and bulletproof vests to medical kits in case of emergencies to things like insurance. What happens if, god forbid, somebody dies on assignment? What’s your experience working with diasporan Armenian media? Do you report on Armenian issues? I have written about Armenian issues for mainstream media [in Canada]. I always do it reluctantly because I’m very passionate about objectivity. I realize that as an Armenian, I bring an understanding of the community, history, and culture, but I also bring certain prejudices. There’s also the question of credibility. Whenever you write about the Armenian Genocide and you are an Armenian, the other side could always say the piece is obviously biased. On the flip side, for example, now with the influx of the Syrian refugees [in Canada], [my being Armenian] gives me access to the Syrian Armenians. Right now I’m working on a couple of stories that I can access because in most cases [the refugees] don’t speak either English or French, and I can get their stories because I speak Armenian. That definitely gives me an advantage. Whenever [diasporan Armenian media asks me to write about the Armenian Genocide], the first thing I tell them is you know, I’ll have to go and get a comment from Turkish side. And in some cases, the discussion ends there. In other cases, if these are more sophisticated people, they’ll say yes, as long as you give our side fair treatment. Because [the Genocide] is such an emotional issue for us, it’s very hard for us to understand that the other side has equally strong emotional views on this issue, and that for them, that issue or those views are equally valid. A journalist’s job is not to be a PR person for his community, but to try to present the information as fully and as objectively as he can, given his cultural background, his prejudices and everything,. And this is what I try to explain to people who sometimes tell me, Levon, why don’t you write about this? And I would say because I can’t do a PR job; my job is not to be a PR officer for the Armenian community. I am a journalist. The job of a journalist is sometimes to talk about painful things that we don’t want to talk about. In 2004, 2003, I was writing something on the Armenian Genocide, and— it’s normal, it’s part of my journalist DNA that I have to get some kind of a statement from the other side. I called the Turkish Embassy and had this very strange conversation with the Turkish attaché, and he basically said well, I’m not going to give you a comment because you’re going to twist everything I say. So I went to my editor and said, they won’t talk to me, please get somebody else to call them and get a statement. And even then that was just a generic statement from them, which they could have given to me. My biggest pet peeve about the diasporan Armenian media is that there are very few independent voices that are not controlled by either one or the other political party or affiliated cultural organizations. Last question: you wanted to talk about corruption in the media in Armenia. Yes. I occasionally hear stories from friends of mine who live in Armenia, who have businesses in Armenia about getting approached by various media organizations or journalists who say, you pay us and we won’t write any negative stories about your company. It’s a form of journalistic extortion. It completely discredits the profession. And these news outlets are they mainly newspapers, online media, or…? I have heard about both online media and newspapers. But again, in a society where there’s so much corruption… that corruption seeps into all kinds of sectors. If you pay bribes in hospitals and schools and universities, why not to journalists? The problem with journalists is that journalism is supposed to be the watchdog. But when the watchdog is corrupt, that’s an enormous problem.